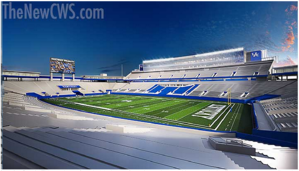 Toadvine Enterprises is proud to be a part of the $110-million renovation of Commonwealth Stadium, home to University of Kentucky's Wildcat Football. While the tradition of the venue will be preserved, the Commonwealth Stadium will now be state-of-the-art. Part of Toadvine's role in this project is one we think fans may appreciate the most in the upcoming season—backrests! We sigh with comfort just thinking of it! All of the lower bowl seats on each side will now be complemented with backrests so you can sit back, relax, and watch your Cats. In addition, we will be closing in the deck around the recruiting platform as box seats for hosting large parties or for impressing business clients. We started this project early April, and will complete it by June. Fans will enjoy the benefits of the new stadium amenities on September 5, 2015 for the official opening. This complete renovation will also include a full face-lift to the outside of the stadium giving it a more modern look. Even the concourse and concessions will be revamped and widened to give the stadium a more clean and open feel. A lot of thought and time has gone into the overall project. Toadvine is honored to have its hand in the makeover of this historical facility, and can't wait to unveil all the hard work this September. For more information about the project and the vision, click here. A while back, Toadvine had the pleasure of contributing to the renovation of the historical Iroquois Amphitheater and helped to modernize the venue while still holding on to its historical significance. 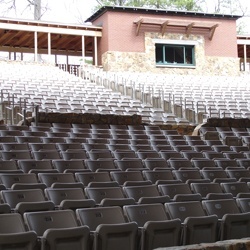 Originally constructed in 1938, the Iroquois Amphitheater and park is a favorite spot for families and friends. With the days getting longer and warmer, the desire to be outside is growing. Kids are getting out of school soon, and with Derby season here, Louisville will be jumping back to its summer buzz. The amphitheater has many fun events planned for this summer, including movie nights on Mondays and Saturdays, Louisville Youth Orchestra to kick off Derby season, and popular bands like Death Cab for Cutie and Wilco. The venue holds 2,366 and though it seats quite a few people, the layout and design still provide an intimate setting for shows. The free events are a great option for families looking to fill in summer evenings with movies like Frozen, The Lego Movie, and Muppets Most Wanted all on the big screen. To see the full summer calendar, click here. We at Toadvine take pride in our work, and love seeing it being used and enjoyed. We hope you enjoy your time this summer and take advantage of South Louisville's favorite gem, Iroquois Park.